HITTING CENTRESTAGE against the backdrop of the mystique surrounding his non-performance in Jamaica for over 44-years, it quickly became apparent that something unusual was about to happen as a recording of the rambling sound of Perry’s voice, interspersed with the unsynchronised clattering of several instruments, echoed from the massive speaker boxes. Clad in an off-white outfit, littered with buttons bearing the picture of Haile Selassie alongside metallic and glass objects, a cap covered with glass balls, clocks and globes; a necklace with beads, glass and a small coconut; and a pair of boots freshly painted in red, green and gold, the relaxed-looking Perry opened his set with the song, Respect to Jamaica. 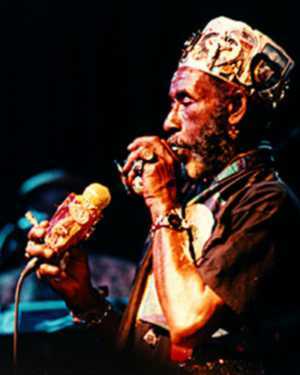 In giving the reason he has not performed in Jamaica for over four decades, the sprightly Perry, who was sporting a red, green and gold hairdo below his space-age style ornamental cap, said it was because he was not getting enough respect for his musical contributions, which included several songs he wrote for Bob Marley, which became international hits. In the early phases of his performance, the seemingly meticulous Perry, could be heard rambling in his rhyming style that his play-list had been altered without his knowledge and that the musicians he had rehearsed with were not the ones on the stage. He also vented his frustration about being given a strange microphone to use. Despite his ramblings, Perry nonetheless seemed anxious to please as he delivered near perfect renditions of, Curly Locks and Duppy Conqueror. His performance stepped up a notch when his personal microphone, which had similar ornaments to those on his cap, was plugged into the system and handed to him. Perry then went on to skilfully caressed the lyrics of songs such as, Small Axe, Who the Cap Fit and Exodus, which were all done with his special flavour. As he dug into the lyrics, you could see a look of respect coming to some of the faces, which had earlier seemed ready to laugh him off as a joke. Amid the cheers that came at the end of his performance, Perry was presented with a special plaque by promoter Worrell King in recognition of his contribution to reggae music, which included being the early teacher/mentor to reggae greats Bob Marley, Peter Tosh and Bunny Wailer. He promptly declared that he was still fit and ready to do wonders in the music business. “I am 70 years old and I have no wrinkles and I have not done any plastic surgery,” said Perry, stroking his face with a wry smile. “I gave the wrinkles to Mick Jagger (lead singer of the Rolling Stones) and the politicians,” he said.